Ensure the security of your call by activating Secure Hold Music if the Host is disconnected from the call. This feature gives you control of how a conference behaves should the host disconnect during a conference. This can often be useful where there is a risk of a host disconnecting due to connectivity or technical issues and where it would be inappropriate or disadvantageous for the conversation to continue without the hosts’ oversight. On the Landing Page, you'll see the Conference Details tab displayed by default. It shows essential information needed to host a conference call and allows you to change your conference preferences. Under the ‘Audio Conferencing’ heading, as shown in the screenshot below, you have access to your advanced settings. 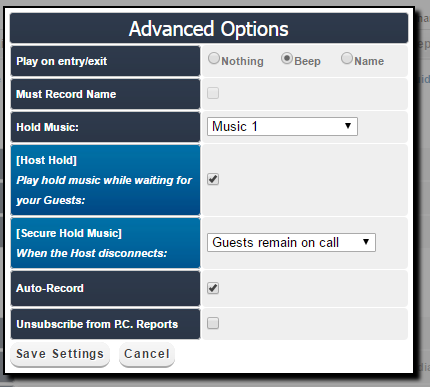 Under the ‘[Secure Hold Music]’ section you will see a drop down menu, this allows you to select from three options for what will happen to your call should your host disconnect mid – conference. Guests remain on call: The conference will continue without interruption (Secure Hold Music is not enabled). Guests are disconnected: All remaining participants will be automatically hung up and the conference will end. Guests hear hold music: All remaining participants will hear hold music and will be unable to speak until the host returns to the call (Secure Hold Music is enabled). Once you have made your selection hit ‘Save Settings’ and you will be redirected to the ‘Conference Details’ page. Your conference preferences will now be updated. Why is there Hold Music in my call? If my guests dial in the call without the Host, what happens?